Nothing feels as satisfying as ending the day with with streams of affection towards someone you love. Nothing is as sweet as receiving some heartwarming wishes from the person with whom your heart grows in love. Putting these together, I’ve decided to put you on the giving end and your lover on the receiving end… The same reason you’re here for Good Night Messages to Your Love, right? You are trying to make your girlfriend happy tonight but somehow, you keep staring at the ceiling wondering what to text her right now. Or perhaps, you don’t really know whether your text will make her feel loved before she goes to sleep, right? 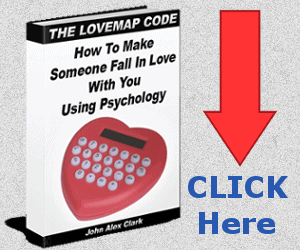 I see, that’s why I have written these romantic good night messages you can send to your girlfriend right away and make her feel she is the best thing to have ever happen to you. 1. My millennial Cinderella. Lol, I hope your day was blissful, may this night bring you solace like yesterday’s. 2. Like the way you always chuckle while in my arms, may you smile throughout the night. 3. May you find peace of mind as you lie on your bed, girl. 4. They say that joy comes in the morning. So they mean to wish you a mournful night before morn? I don’t pray so, may your night be a blissful one too. 5. To the icing that makes my life to taste spicy like a well-prepared cake, may your night be full of merry. 6. Although, times are not halcyon like before, but may your night come with tons of blessings as the sun begins to slumber. 7. May this night be the verb of a serene after-day to you, my love. 8. Good night to the ‘heartress’ that controls the throbbing thing behind my chest. 9. If dear means someone close, I see you as my dearest and may the solace of this night shower upon you. 10. I wish a splendid night to the Romeo who just read this sentence. 11. Bye for now, may you sleep peacefully and wake to continue with peace of mind like I left you. 12. If walls could talk, may their lips part and paint how cool my heart wishes for your night to be like. 13. I wish a merry-filled after-day to the one that makes my heart tingle in happiness. 14. As I leave you, dear, may you find peace of mind throughout nightfall. 15. I wish I wrote you a poem, my girl. But as you sleep may your cheeks spread out of inner joy that fills up your heart. 16. May the peaceful feeling of sleeping be with you, heartress. 17. May your night be prefixed by good, as you go to lie and wait for morn. 18. I just thought of sending you this to make you know that I hope you don’t ever feel bored as night falls again. 19. My girl, you know that there is a distinct feeling of incompleteness that beclouds my mind without you right? Anyways, good night in advance. 20. 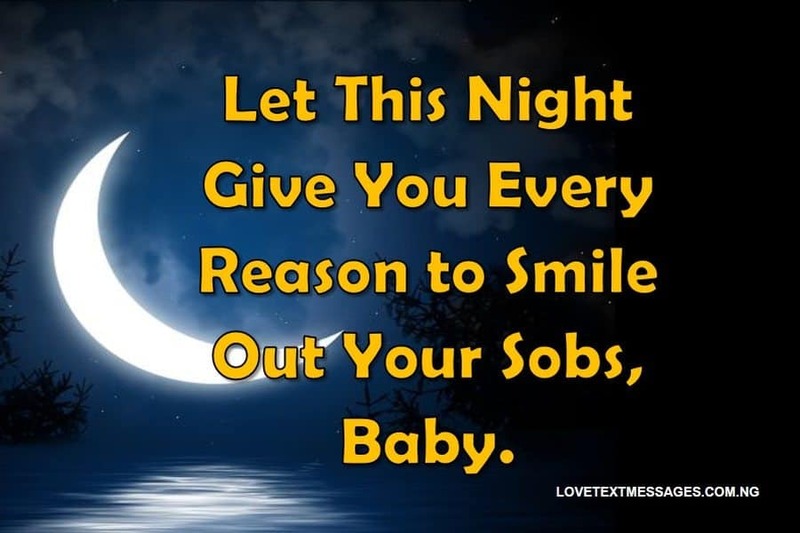 Let this night give you every reason to smile out your sobs, baby. 21. See, even if life will cuff my arms and ask me never to wish you a good after-day, I will not mind staying behind bars. 22. I know that it was stressful throughout the day, but I hope your night will be heart-rending with joy. 23. If yester-night was bad, tonight will be a real-life scenario of bliss to you, my love. 24. May this night bring you comfort and reasons to smile more my girl. 25. Since a friend is one who makes the other feel happy, I will not mind sacrificing my time just to make you smile to bed. 26. You know I care for you right? May your night be even fun-filled than the day. Bye for now. 27. I know that your legs are still waiting for your eyes to shut up their lid to begin your journey to dreamland. Lol, I wish you a dazzling night ahead. 28. I know that the time is yet to tick five but, I just felt like wishing you a blissful nighty sleep in advance. 29. May the warm air of this season caress your gentle skin while I am away, good night to you. 30. Good night to the queen to be of my future palace, lol. But, I mean it doesn’t you know? 31. So you are still awake by now? Well, that’s good, I wish a relaxing night rest to you, my hardworking damsel. 32. Cinderella, yes you! Are you stranded? I wish you a blissful night, okay? 33. It’s time for you to have some rest.Good night to you my love. 34. Good after-day to the person my heart skips anytime I behold her figure. 35. To the comely angel reading this, may your night be full of sweet dreams. 36. Have a splendid night ahead, if you like a snore. Ha ha ha, I don’t mean that.But, good night. 37. As the clock ticks the first hour of the night, may it instantly flush your sorrows away. 38. 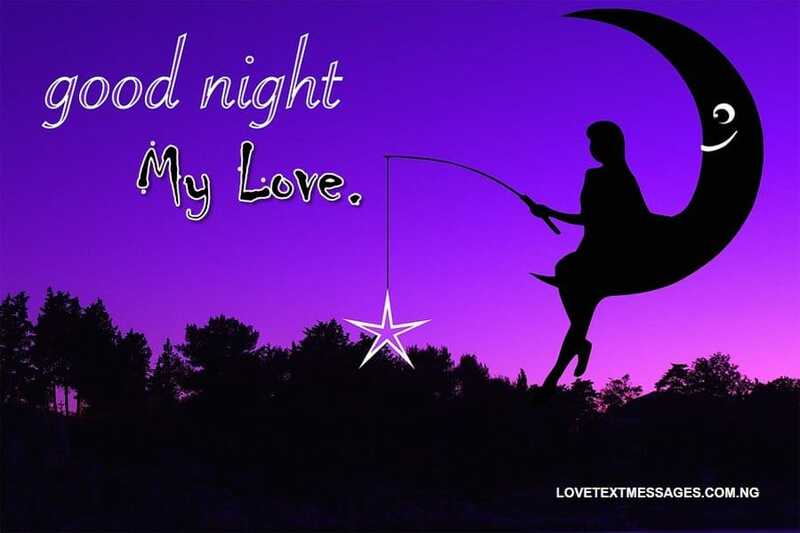 I wish a good night rest to the dearest angel of my life. 39. As you lie on your bed tonight, may you be calmed from your aching head to your weary nerves. 40. May all the heartaches you felt during the day be gone this night. 41. I wanted to shout a big GOOD NIGHT WISH. But, let me just whisper this; I love you, my girl. Have a serene nighty sleep. 42. Even if the worse forces of darkness prevail over tonight, you will be saved by grace, I pray. 43. To this one-of-a-kind-girl that stays by me, even when times are hard. I wish you a happy night ahead. 44. To the one and only lady that treats me like a baby, may you be blessed tonight, okay? 45. May this night fall and shower its blessings like never before, girl. 46. I wish that I am close by to stare, count and admire the moon and stars with you.Anyways, goodnight to you my love. 47. Bye, I will miss you. Go and catch the fun that night comes with. 48. May your night be the definition of splendour, girl! 49. Since everyone seems to wish his girl a blissful sleep.May yours be more than the word itself. 50. From my heart is a sincere wish that you enjoy every bit of tonight. You have a boyfriend, but find it a bit difficult to write a romantic good night message to him right? Don’t worry, I have got you covered. Down below is a list of so many wishes you can choose from and send it to your lover. 1. I miss your sweet voice that sounds so fatherly. Good night dear. 2. Anytime I think of your touch and comeliness, my heart begins to thump fast in anticipation of when morning will come.May your night be full of bliss boy. 3. At cold moments like this, I really long to feel how your arms will clutch and warm me. Good night my love. 4. Night has fallen again to let me have you in my arms, as I ease off the stress of the day. Good night in advance. 5. Show me what my heart craves for; love and affection tonight. 6. I wish you the bliss of nightfall as I long for your presence too, while you are away. 7. I really lack words to paint how my heart feels for you boy! Good night. 8. If splendour is what your previous nights were filled with, I wish you more than that word. Good night in advance. 9. To my to-be husband.You will know no sorrow from tonight henceforth. 10. As night falls, may your pains and throes be healed even before evening runs out. 11. I wish you all the best reasons and thoughts that will make you feel chuffed tonight. 12. You’ve got to be sleeping by now, okay? Relax, my love. Good night. 13. I can’t predict what time will unfold.I hope it turns out to make you have a reason to say be happy, tonight. 14. May the splendour of night be what you will experience as you go to rest for the day. 15. To the young king reading this; may you be blessed by a tranquil night. 16. May the sweet sensation of night fall on your way tonight.Bye. 17. Did I ever say this? You are the best thing that has ever happened to me, being the gluey hand that mended my once-broken-heart. Take care of yourself and enjoy your night. 18. Good night and sweet dreams to the only boy whose bosom I constantly crave. 19. Don’t ever forget me in your dreams. Always know that I care for you. Good night. 20. Goodnight love, my body is craving for your tender touch. 21. I really need your love so much than ever before, good night my dear. 22. To the young man I treasure so much, may your night be full of serenity. Okay? Bye for now. 23. The thing that normally brings us together has fallen again, good night. 24. It’s always a splendid experience being with you, good night dear. 25. I will be there for you when you are awake, too. Sleep well, okay? 26. Can you let me have all of you, tonight? 27. You are the one and only company I long for whenever my eyelids become gluey at night.Rest well. 30. I want you to take and see me as the queen that I am. Tonight. 31. It will be cool to have my day end well tonight like it normally does with you by my side. Good night. 32. To this lion that makes me know I am a woman. I wish you a dazzling night ahead. 33. I can’t contain the joy my heart feels to know that you are mine.Good night dear. 34. Dear boyfriend, may the excitement that runs through my mind anytime I think of you, be what you will feel too. 35. I can never stop fantasising about you boy! Good night my dear friend. 36. 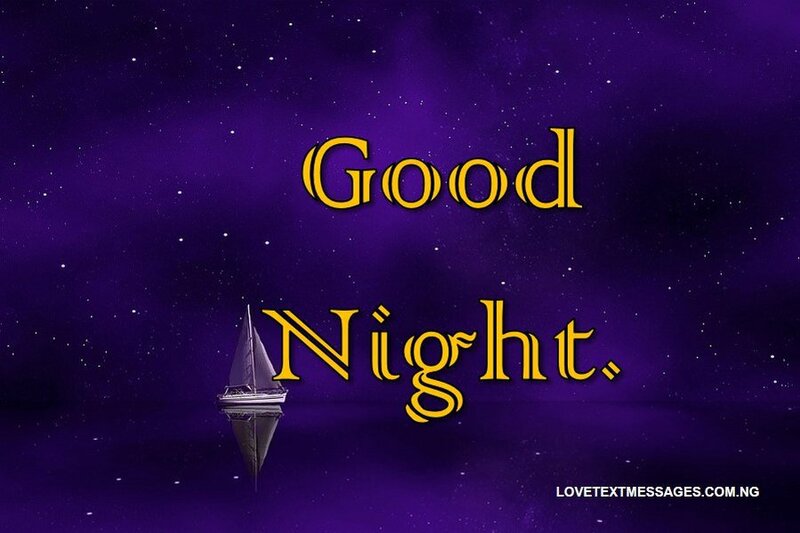 May this night be a tranquil one for you as you lie beneath your blanket. 37. 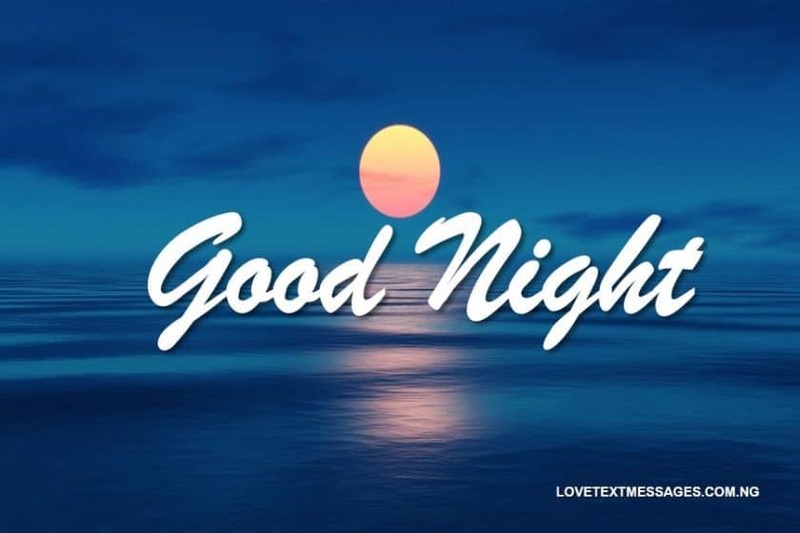 As you sleep to reminisce about your day, may you find peace of mind, body and soul. 38. May the showers of blessings soak you that you may not even get to dry yourself tonight, LOl. 39. I really hate to know that I can’t hate the young man reading my funny sentence.Ha ha ha, good night. 40. I can’t make things happen by magic, but your life will have one more cause to be happy before morn, trust me. 41. I really miss your smell, touch and deep voice that sounds so mannish and comely, good night my love. 42. If it were my choice to decide when the clock ticks, I will halt its steps and make us have a replay of the halcyon times we will tonight. 43. The day was really stressful but, my heart feels so excited because I have got you, good night rest dear. 44. Let the throes that your heart still harbours be calmed by night’s serenity. 45. You are like a fire in my life that makes me feel warm whenever I am cold.I wish you good night my love. 46. So long as the stars continue to gleam, we will shine together too.Wishing you a splendid night ahead. 47. As you go home tonight, may your lost energy be replenished, my dear. Good night to you. 48. Just because I am not around, does not mean I am not concerned about you. I care and always wish you the joy that night brings. 49. I wish that you will always be smiling and even forget all your worries despite my absence, Good night to you my sweetheart. 50. Sleep well and relax okay? Don’t worry, I will sue you for depriving me of my right to freedom of being alone and happy by just your looks and smile.lol, good night dear.